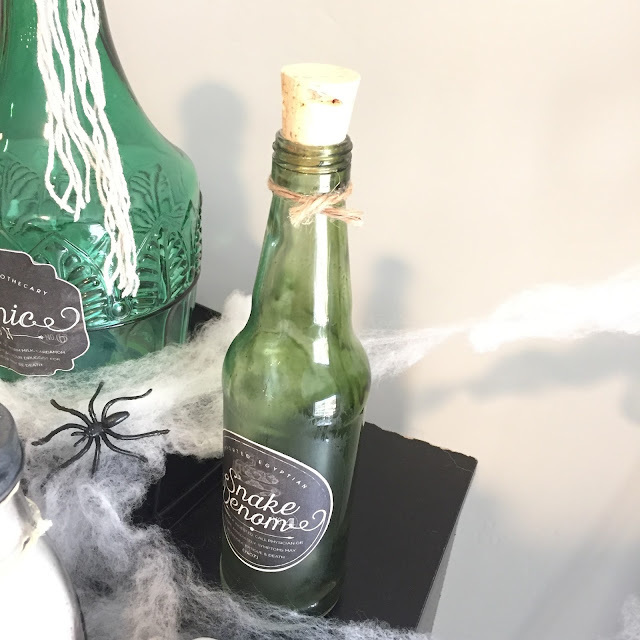 These Halloween apothecary or potion bottles are so fun! I remember seeing them around the internet a lot last year and knew I wanted to make some. Here’s how I made mine. Let’s get started! 1. I started off with searching for labels. I wanted to see if there were some already out there or if I needed make my own. I came across these labels by Lia Griffith and they were so perfect I didn’t feel like I needed to make them myself. She really went into a lot of detail with them. “Nymph Picked Toadstool Clippings,” “Imported Egyptian Snake Venom…” the only one I didn’t use was “Werewolf Fur” because I didn’t have enough bottles. 2. Now that I had awesome labels I went on to finding bottles that the labels would fit on. Most of these I already had from other occasions, but I did end up buying the “Horn Dust of a Unicorn” jar and the “Arsenic Poison” bottle. None of these bottles had corks so I found a small bag of corks at Jo-Anns. – I did this treatment 6 times (each bottle one time, except one I re-colored again) and each bottle had major streaking. The author of the tutorial claims her way will prevent streaking, but I couldn’t get it to work. But lucky for me, it only added to my grimy Halloween look! So it ended up being awesome, but I wouldn’t try this if I wanted it perfect. – Her measurements are great and same with the oven temperature and time. Mine streaked so much I wonder if I should’ve changed her first 3 minutes to 2 minutes before flipping them over. If there is a next time, I will try that. 4. Print your labels on sticker paper. You can find it at most stores like Walmart or Amazon. Cut them out and see which labels look best on the bottles you have. After you figure it out, tape them on the bottle so you know which one is which. Or write it down so you don’t mix them up because you will need to remove the label to paint and bake it. 5. Prep your work area and make sure you have newspaper to protect your surface. I had some leftover packaging paper that ended up being awesome because I wrote notes on it as I worked. That’s not blood – it’s red food coloring. 6. Follow the directions on coloring the jars/bottles. 8. While your bottles cool off, paint any finishing touches you need to do. I painted my lids to make them look more rustic and old. I also painted the “Horn Dust of a Unicorn” jar grey on the inside to make it look older. I made cuts into my new corks to also roughen them up. 9. When your bottles are cooled off, grab your Modge Podge. Peel off the stickers and place them onto your bottles and jars. Smooth them out. Some of them may get a little crinkly as they try to mold onto crevasses or on rounded edges. It only adds charm! Brush on some Modge Podge on the stickers so they’re sure to stay in place. 10. When the labels are dry, grab ribbons, yarns, twines, whatever you have to doll up, I mean, grime up your bottles. I have individual pictures of each bottle where you can get some ideas on how to decorate them. I just adhered my supplies with hot glue. – “Bone Powder:” Baking soda. – “Horn Dust of the Unicorn:” salt and gold glitter. Could also use sugar and/or silver glitter. – “Snake Venom:” empty. I didn’t want to put actual liquid in here because I didn’t want to risk a leak, so I tried seeing what a piece of paper would look like, if it could fake the look of liquid, and it doesn’t work. It looks like a message in a bottle. 12. After the bottles are full, hot glue the lids/corks on. I didn’t want to risk having baking soda spilled all over when I pack them up, so these suckers are in there fo’ life!